During this year's Big Game, only one person will get to taste the rainbow. Non-sports fans are well aware that the real appeal of the Super Bowl isn’t the action on the field: It’s the theatrical, inventive, celebrity-studded advertisements that generate the bulk of next-day conversation. But what if the best ad this year is the one we don’t even get to see? Like many major brands, Skittles has a Super Bowl commercial prepped and ready to go for game day. But unlike the others, Skittles isn’t banking on it resonating with the more than 100 million viewers expected to tune in—in fact, the vast majority of fans will never see it at all. 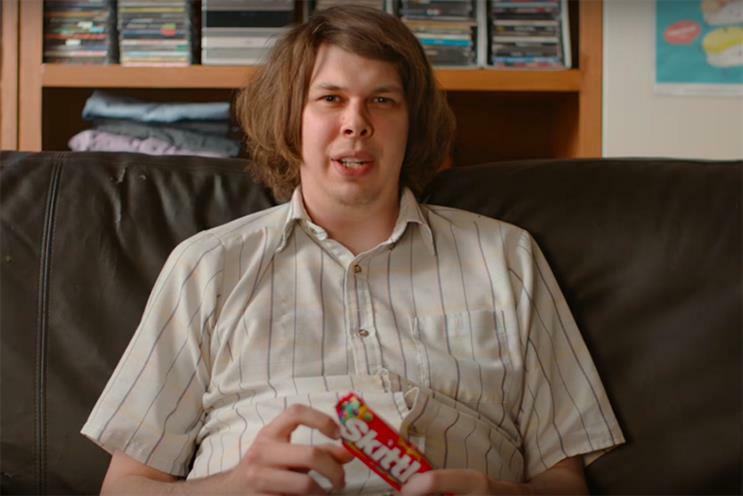 That’s because the 60-second spot will be seen only by one person not directly involved with its production: Marcos Menendez, a teenager from Canoga Park, California, who was specially selected for the honor based on his real-life devotion to the candy. Created by DDB, the hyper-exclusive ad is being crafted for Menendez specifically, to be revealed to him on Super Bowl Sunday. Though Skittles has participated in the Super Bowl frenzy for the past three consecutive years, the agency said that this year’s goal was to generate a buzz not with an ad itself, but the lack thereof. "The Super Bowl is the most cluttered marketing window of the year in the United States. Every brand tries to outdo one another in their quest to be loved by 100 million viewers at once," said Ari Weiss, chief creative officer at DDB North America. "But trying to be loved by 100 million people at once often forces most advertising to speak to the lowest common denominator. Which is why most of the Super Bowl work usually ends up feeling more or less the same." Instead of trying to appeal to everyone, DDB decided to dedicate itself wholly to appealing to just one fan. "The entire program was built around Marcos Menendez. We figured if we could capture the heart of Marcos Menendez, the entire world would follow suit," Weiss said. Details about the ad’s contents are necessarily shrouded in secrecy. We know that it will include one celebrity appearance, to be revealed to the public in forthcoming teasers. But will it be uplifting? Inspiring? Funny? Unclear. So how was Menendez chosen for the honor? DDB said that the emphasis was on finding a genuine devotee of the fruit-flavored candies—someone who would truly appreciate the gesture. "We searched for someone who is a real fan of Skittles, with zero commercial experience, who we thought would be excited to be involved," Weiss said. "When we found Marcos we instantly fell in love because he was just a perfectly ordinary teenager." But don’t think that just because Skittles isn’t showing the ad doesn’t mean that content won’t still be made. In a very meta bit of performance art, viewers can actually watch Menendez watch the ad in real time on Skittles’ Facebook page, with additional documentary-style footage to be released following the game’s conclusion. Hopefully he likes it!